With nearly five years of experience mentoring students at Oak Ridge National Laboratory, Roger Kisner has advised many young scientists and learned a thing or two from them. 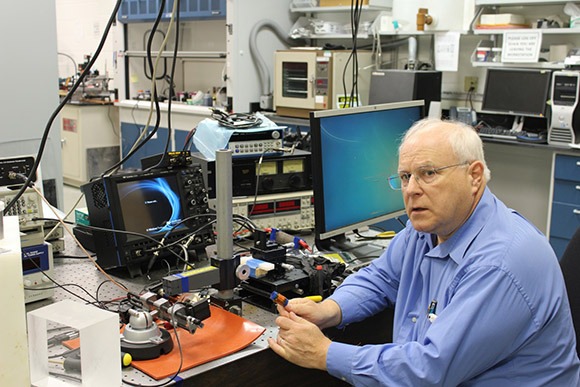 Kisner is a Distinguished R&D Staff member and Distinguished Inventor in the electrical and electronics systems research division. He regularly hosts students in educational programs administered by the Oak Ridge Institute for Science and Education (ORISE). Oak Ridge National Laboratory’s Roger Kisner enjoys sharing his knowledge with young engineers and scientists. He serves as a mentor for students in various Oak Ridge Institute for Science and Education research programs. Kisner’s research involves identifying new methods to measure physical phenomena and designing sensors and systems to take advantage of those methods. These new technological developments allow measurement of physical parameters that may not have been possible previously. He often finds himself involved in a dozen separate projects. His participation ranges from consulting to working hands on to managing the project. Kisner enjoys witnessing the mentoring process come full circle. He noted the internship of Christi Johnson, a student who entered the Science Undergraduate Laboratory Internship program under his guidance after receiving an undergraduate degree in physics. At the end of the day, Kisner celebrates when students reach a new discovery or understanding after struggling with a particular concept. Whether he is guiding the students or the students are sharing new information, Kisner considers the process to be worthwhile. The Oak Ridge Institute for Science and Education is managed by ORAU for the U.S. Department of Energy (DOE).